Description The Bell47 is a famous 2/3 seater light helicopter, designed by Arthur M. Young. Characteristic is its famous teetering rotorhead with stabilization bar and 'fish bowl' cockpit. Model 47 can be seen as the father of the light helicopter. It was also the first helicopter with a type certification (8 March 1946). There have been more than 5000 units built. The first helicopter certified for commercial use, the Bell 47 is still flying. The Bell47 is a famous 2/3 seater light helicopter, designed by Arthur M. Young. Characteristic is its famous teetering rotorhead with stabilization bar and 'fish bowl' cockpit. 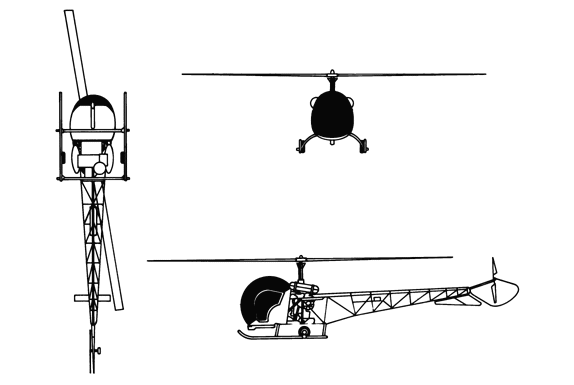 Model 47 can be seen as the father of the light helicopter. It was also the first helicopter with a type certification (8 March 1946). There have been more than 5000 units built. The first helicopter certified for commercial use, the Bell 47 is still flying. The wet sump TVO F1A engine noted above is a rarity (I flew the last Bell47 made with one of these engines) as most have the normally aspirated VO-435 engine or the turbocharged dry sump engine. Do you want to comment the Bell 47G helicopter?